The Hebie 695 is the first steering stabiliser I’ve ever used. I didn’t quite know what to expect when I unpacked it. I guess I had in my mind that a steering stabiliser would hold the front wheel straight when you lean your pannier-bag-laden bike up against something, but also that it would keep your wheel stabilised when you want to ride with no hands. 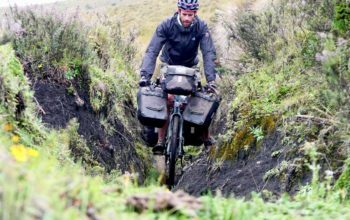 In actual fact it does do both of these things but just not to the extent I envisaged – front pannier bags are too heavy to keep still. What is a steering stabiliser? A steering stabiliser creates a resistance in your steering to pull the front wheel to centre whenever possible. Essentially, there is no steering resistance when the wheel is straight, there is a little steering resistance when turning around sweeping corners (slight turns), and for slow speed manuvering (sharp turns) there is a lot of resistance. Steering stabilisers are common practise on many motorbikes, especially touring motorbikes which need to be manuvered easily at speed on rough surfaces, and especially in sand. 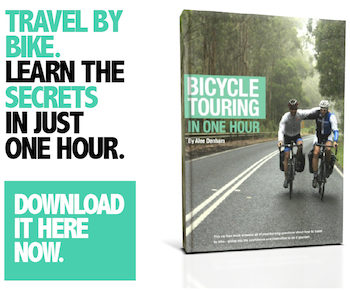 Why is it important on a touring bike? 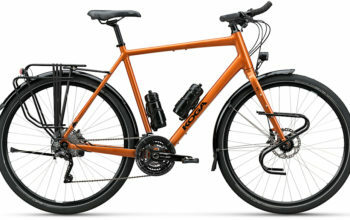 The first is for when you are parking your bike; the wheel is unable to swing right around when you have front pannier bags and/or a handlebar bag. This means that you can lean your bike onto just the rear panniers and the bike is sure to stay upright. The same applies for if you use a side kickstand. And secondly, the steering is smoother and lighter with lots of weight on the front end of the bike. This applies to both slow and high speed handling; no more wrestling the front wheel for direction! Sometimes riding with lots of weight can be a handful, but the stabiliser assists to provide quite a secure feel to the front end. The Hebie 695 is simple. There is a part that mounts to the crown of your fork, a part which clamps onto your downtube and a spring in between them both. 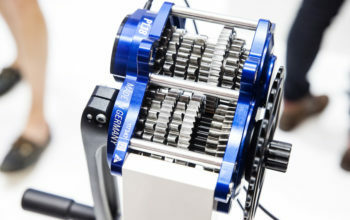 The spring tension is adjustable, so depending on how much weight you have at the front of your bike, you are able to increase or decrease the resistance. The cost of the stabiliser is $25AUD for the 695 (spring) and $50AUD for the 696 (elastomer). Clearance. It is essential to check that there is enough room between your downtube and mudguard to get the stabiliser to fit. Kat’s bike with a 26″ wheel had no issues, however there was limited space for my bike with the 700c wheel. On my bike I had to remove the tension adjuster dial to replace it with just a nut (see top photo). The nut fulfils the same job however makes it trickier to adjust the tension. Over-tightening of the downtube bracket. When I was fitting the downtube bracket to Kat’s bike, I managed to over-tighten it so that the nut sunk through the plastic. Upon reflection, I probably didn’t need to tighten it that much as the rubber shim keeps this piece still. 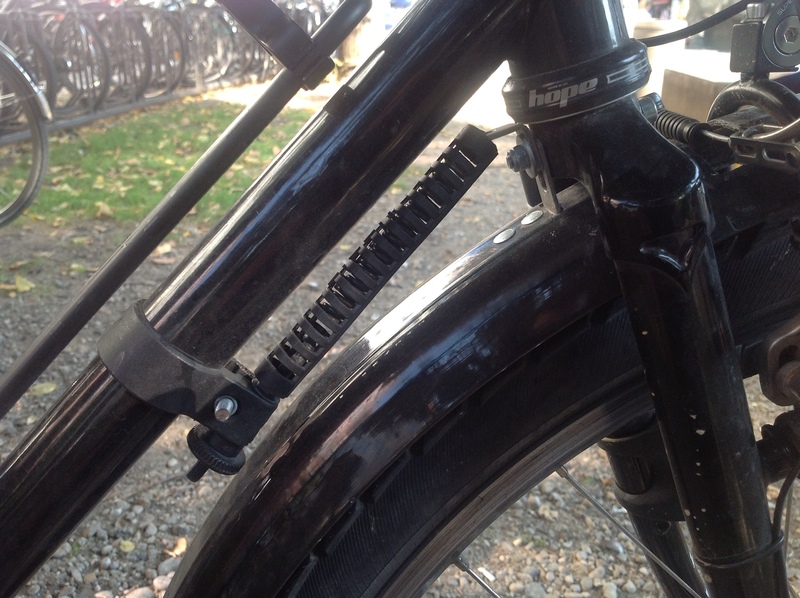 Afterwards I went to the local bolt shop and got a longer bolt, spacer and nut and the stabiliser was back in action. Getting the fork crown bracket to sit still. As a result of the left and right movement from your steering, the bracket mounted on the fork crown likes to rotate to one side. This doesn’t cause too much grief, it just unbalances the stabilisation slightly. I have found that I need to make the nut super tight and press the top edge of the bracket against the bottom of the steerer tube to ensure it doesn’t move. I would think that using a rough edged washer might assist as well. Noise. When the spring is at higher tensions it makes a ‘clang’ sound when you sharply steer. It only really happens when you’re wheeling your bike or riding at very slow speeds. Double-legged kick stands. 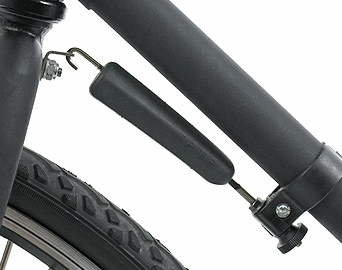 If you are touring with a double-legged kickstand, the Hebie stabiliser is not the product for you. Double legged kickstands force your front wheel in the air when you use them, and unfortunately with front pannier bags there is too much front end weight to keep the wheel centred with the stabiliser. 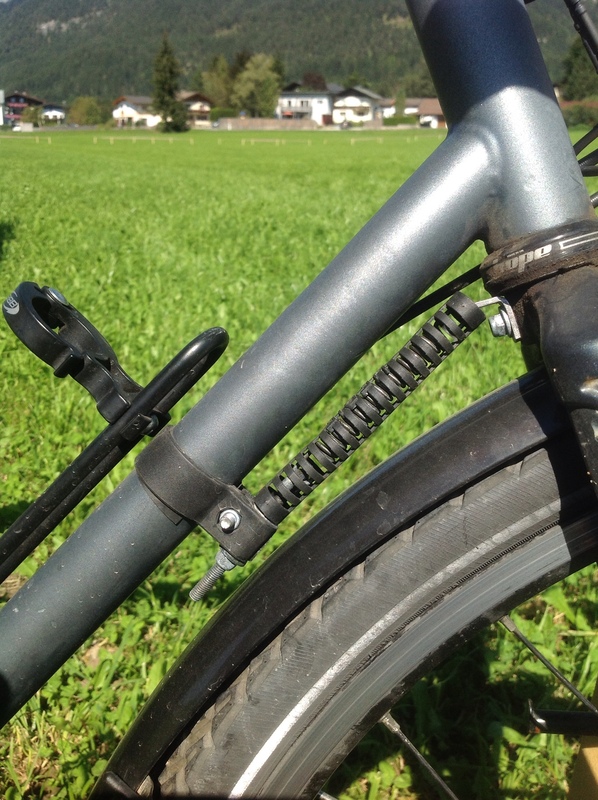 If you are using just a handlebar bag, the stabiliser will work fine with a double-legged kickstand! The 695 uses a spring design whereas the 696 uses a piece of elastomer to do that same job. I haven’t used the 696 but I am going to assume that it rides similarly, is of a similar weight and has less spring noise. It is essential to check firstly that there is enough clearance between your front mudguard and your downtube to fit the 696, which is the largest steering stabiliser of the two. 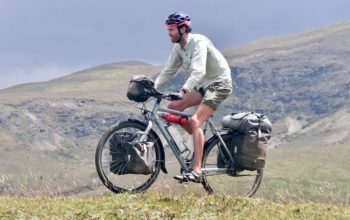 So, is a steering stabiliser a valuable touring bike product? I would say yes. 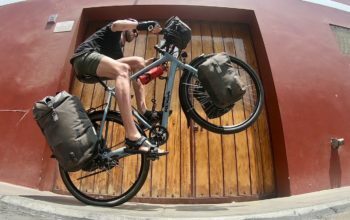 The Hebie stabiliser makes both bike parking easier and improves the handling of a loaded touring bike. It is definitely not a miracle worker, but will make your life easier. At $25AUD it is not going to break the bank – even if you don’t like it. 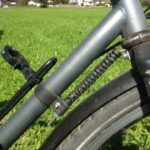 It is important to adjust the stabiliser so that the tension of the spring suits the load you are carrying on the front of your bike. The heavier the load, the more tension you want on the spring. 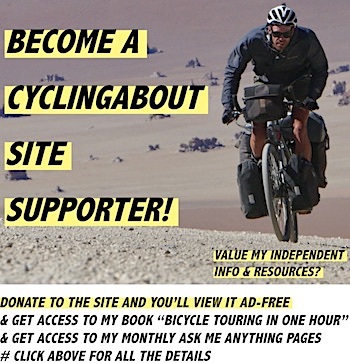 If you are looking at buying one make sure you have enough clearance between your mudguard and your downtube, as many touring bikes (especially with 700c) may have the same problem I had. If you’re Australian you are able to contact Joad Sportz Supplies who are the importer of this product – they will point you in the right direction of the nearest bike shop, or with a small postage cost will deliver one to your door! International folk will be able to check the Hebie website for more details.